After several weeks of rumours doing the rounds, free agent and former Maple Leaf, Cody Franson has penned a 2 year deal with the Buffalo Sabres. Since making his trade moves before and during the draft, Sabres GM, Tim Murray has openly admitted that he was in the market for an experienced left handed defence man either from Free Agency or by another trade. Well today Tim got his man, all be it a right handed defenceman, not quite the lefty he was after. But will that really matter? Not really if you ask me, for me Sabres have now got a strong very experienced man on the blue line, he boasts a heavy shot and will quarterback one of the powerplay units I’m sure. After missing out on Jonny Oduya, despite throwing a stupid amount of money at him, Sabres certainly needed to make a move and looking at some of the depth players we had already picked up in Carlo Colaiacovo and Matt Donovan a trade was really looking like an option but that might have meant giving up a fair amount. In the end the addition of Franson certainly gives us a top 4/5 defenceman. I can certainly see him lining up on the right hand side of our defence in October and actually gives us a balance with the depth guys. Looking at the roster I perhaps wonder if he’ll line up alongside Josh Gorges in our top 4. Interestingly too in Tim Murray’s interview he also mentioned that a deal with signed FA Pat Kaleta is still not dead in the water. I’m still hopeful that Tim can find a role for the heartbeat of the Buffalo team I have followed for so long. 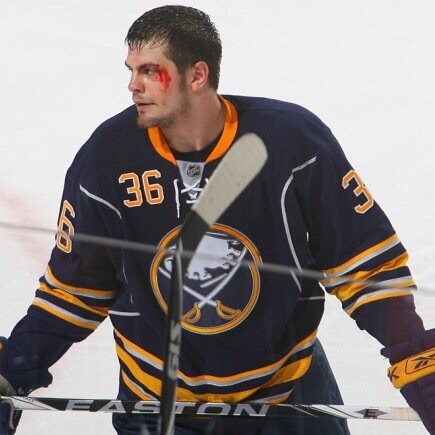 Here’s hoping that the Sabres can reach an agreement with Pat!